Optimized for our Exo-Flow Capture Kits and available only from SBI, Exo-FITC is a proprietary reversible fluorescent stain for visualizing exosomes. Exo-FITC is comprised of the commonly used fluorophore fluorescein isothiocyanate (FITC) conjugated to a protein that recognizes post-translational modifications on exosomal surface proteins, enabling general staining of exosomes. 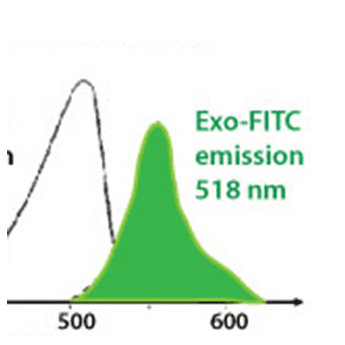 However, the feature that really makes Exo-FITC stand out as an ideal reagent for FACS-based isolation of exosomes is its reversibility—after staining with Exo-FITC and flow-sorting by FITC-positive gating (Exo-FITC’s excitation and emission wavelengths are 494 nm and 518 nm, respectively), Exo-FITC can be removed from exosomes through the simple addition of Exosome Elution Buffer, which simultaneously elutes exosomes from the Exo-Flow magnetic beads and removes bound Exo-FITC. Simply (1) couple biotinylated antibody to the magnetic streptavidin beads, (2) use the antibody-coupled magnetic beads to capture exosomes that have been isolated using either ExoQuick® or ultracentrifugation, (3) wash away unbound exosomes, and then (4) stain with reversible Exo-FITC (excitation and emission wavelengths of 494 nm and 518 nm, respectively). Exo-FITC enables selective exosome isolation via FACS. Exosomes are isolated using the CD9 Exo-Flow Capture Kit and flow-sorted using FITC-positive gating.